Linkin Park Share New Live Video of "Sharp Edges"
Linkin Park are set to release their new live album One More Light: Live tomorrow (December 15), and to give it one last push, they've rolled out a new performance video of its "Sharp Edges." 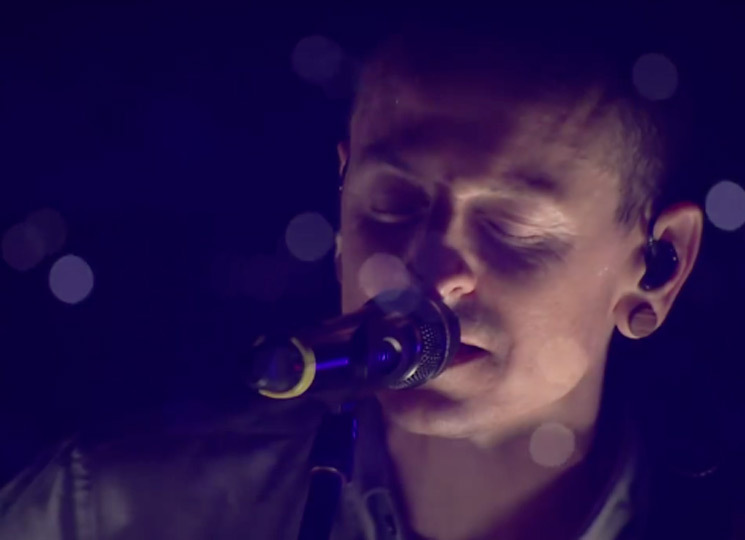 Down below, you can watch the newly shared clip, which is an intimate one and puts the late Chester Bennington front and centre. We dedicate this live album to our brother Chester who poured his heart and soul into One More Light. After we finished recording the album, we joked with Chester that — since he had delivered so many stunning performances in the studio — he had set the bar extra high to produce that alchemy on stage each night. Not surprisingly, he welcomed the challenge. Chester was uniquely passionate, uncommonly generous, sensitive, optimistic, funny and kind. With his voice, he turned pain into catharsis, authenticity into art, and passion into connection. His dedication to bringing these songs to life was triumphant. For those of you who attended this tour in person, we thank you. For those who could not, we hope this live album gives you a glimpse into how magical these shows were for the six of us. Watch the clip for "Sharp Edges" below before One More Light: Live arrives tomorrow via Warner.